Today is awash with economic data. In the UK, earlier this morning, we had September consumer confidence which rose for the first time in four months. In the US, we will have personal income and spending for August, which is expected to remain unchanged. Later in the day, the US will see September's Chicago PMI figures and it's expected to fall. At the same time as that release we have September University of Michigan confidence, which has been known to move the markets if the figure is drastic. Although this month it is expected to rise only marginally. As nervousness was the theme for yesterday, risk wasn't on the agenda for FX investors. Safe haven currencies were back in the picture and the Yen and Dollar took advantage of it. This has continued into this morning, and we can expect it to remain if the data later on today is weak. FX markets are relatively flat with a hint of Dollar weakness as both EUR/USD and Cable makes small gains. The Euro has crept back above $1.3600 to $1.3620 but gains for the single currency remains contained as the elephant is still firmly in the room. Over the short term support and resistance is seen at $1.3570/1.3515/1.3475 and $1.3690/1.3750/1.3800. The Dollar sold off almost one percent on the FX markets yesterday, handing big gains to the likes of EUR/USD, GBP/USD and AUD/USD. This morning the Dollar is seeing a revival as the equity markets dip on the open. 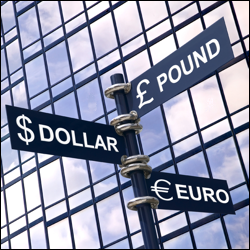 EUR/USD is slightly lower at $1.3570 and GBP/USD is roughly flat at $1.5640. USD/JPY is down a little to ¥76.50 and the pair remains tentatively above the ¥76.00 level. The pair has managed this for the past couple of months but the Dollar hasn't managed to gain back anywhere near the same amount of ground against the Yen than it has against other currencies. The ultimate risk currency, the Australian Dollar, had a bumper day and almost reached parity with the Dollar, peaking just below the $1.0000 level before running out of steam. Today the AUD/USD has fallen back from yesterday's high of $0.9985 to $0.9885. The pair still remains well below its short term downward trend line where a move above parity and then $1.0025 will be needed to break that. On the forex futures markets, it looks like it's the return of risk appetite for now at least. Global equities are enjoying a bit of a rally which has encouraged traders to look for riskier currencies. This has seen a drop in the safe havens like the Dollar and Yen with EUR/USD trading at $1.3517. Support is at $1.3415 and resistance at $1.3560. The Dollar has been the one to watch in recent days and its appreciation has set alarm bells ringing. For now though, the strength in the equities markets is translating to a bit of Dollar weakness across the board, albeit mild weakness. Cable is only a few ticks lighter and USD/JPY is just about flat. It's the ultimate risk currency that's doing well this morning as the Australian Dollar lifts itself back towards $0.9900. However, this is still some way off parity where is so spectacularly dropped below last Thursday. The effect of this weekend's IMF summit proved to have a major bearing on the Euro as it dropped to its lowest level last seen at the turn of the New Year. The EUR/USD pair traded as low as $1.3362 on our spread trading platform this morning, as traders are really feeling the ongoing tension of the European debt situation. The reality is that everybody is looking to the decision on Greece's next round of its bailout package, and the longer it drags on, so does the nervousness. Here's an interesting fact for you; futures traders who trade the Euro versus the Dollar have increased positions on the pair declining, according to figures from the Commodity Futures Trading Commission. Saying all this, it currently looks like there is a small bear squeeze on the go and the Euro has moved higher to $1.3437. Many will be looking to this evening's German survey of business conditions, which is likely to bear an effect on the single currency. The US dollar has been the one to benefit from all this turmoil and has risen some 8% against it's basket of other currencies. This is a big move for the greenback and is one that has got investors and traders across the world sitting up and taking note. Having said that, this morning the dollar is giving back a few of the gains in line with the bounce in equities. GBP/USD is up some 80 points to $1.5425 and EUR/USD is 60 points to the good at $1.3530. In the forex futures markets, with the focus heavily on the FOMC meeting yesterday, the dollar was always going to be carefully monitored by traders. After the Federal Reserve declared their bearish stance, it encouraged traders to pile into the dollar. It hit a two week high against the yen and managed to also reverse all its earlier losses against the euro. It appears the bears are most definitely out for now and we could expect to see traders taking to the safe havens of the currency markets, which certainly include the dollar. The euro is currently trading down against the dollar to $1.3550 which is at a one week low. With equities staying strong yesterday, the bulls were out and traders increased their risk appetite. In forex there was no real news that we didn't already know about the Eurozone or Greece and so the single currency was given a bit of breathing space and managed to post a decent gain against the dollar. Having said that, we know how easily fundamental news can shift traders' mindsets and don't forget that these are extremely jittery markets. Despite its jump yesterday, the euro is trading down at $1.3674 against the dollar and technicals could be suggesting more of the same. The EUR/USD market stands below a strong resistance level at $1.3676 so traders should be cautious here. The euro is having a small 60 pip jump this morning versus the dollar, despite the inevitable news that Italy has now joined the members club of eurozone countries that have been downgraded. After Standard & Poor cut their credit rating late last night, the euro took a dive as traders weren't so keen on sticking with the single currency. Greece are still yet to come together on a deal with the IMF so that is also still at the back of traders' minds. EUR/USD is currently at $1.3655 and near term support and resistance are seen at $1.3600/$1.3520 and $1.3800/$1.3900 respectively. It was a decent week for the euro after world financial leaders coordinated a liquidity package to ensure banks are holding enough US dollars. Nevertheless it seems it was just a bit of a bear market squeeze and traders have resumed normal business this week. The euro dropped over 100 pips against the dollar from last night and has only rebounded ever so slightly this morning. From a trader's point of view, they are jumping onto the euro bandwagon on the release of "patch-up" good news and we see small squeezes here and there. Traders are also looking at the bigger picture though, whether Greece are actually able to pay their debt in full. Currently the euro is trading at $1.3692 against the dollar but stands below its last resistance level, which could signal further potential downside.